I wasn't sure what I was following on Twitter, but I loved all of the Tweets going by from Hicks' and Kittle's webinar tonight. So much change for you, Julie! I wish you all the best as you chart new territory this year. What a powerful line - "Don't should on yourself." Love this!! So right. Thank you for sharing. Best wishes on your new role!! "Don't should on yourself" - truly the best piece of advice I've heard in a while! Also, I'm glad you wrote today. You have a lovely perspective on things. As a new writing teacher, it really makes me think about my teacher writer voice and how is has changed from my student teacher writer voice.. and my aspiring teacher writer voice. Write on! Just reading your post made me want to put my fingers to the keyboard. 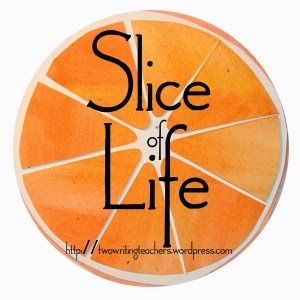 You were right when you said, "Slice of Life is the perfect space for this reflection because this community nourishes me too." It's funny how often SOL brings me back to writing. I'm so thankful for the community and friends like you who keep me moving. This week I'll be asking myself your question, "How do you nourish the writer inside of you?" I've often thought of you during these days, Julie, wondering how you were making it with 'both' moves. They have been such big changes. So glad to hear from you again. In our family for a long, long time we've said no 'shoulda, woulda, couldas"-just like Troy's "don't should yourself". It just doesn't help at all. Good for you for finding a path & starting down it! Thank you for sharing that piece of wisdom. It made me smile too and nothing inspires me more than hearing about others feeling inspired and sharing ideas (with good ice cream as an added bonus). I can feel your energy from many miles away! Julie, glad to see you back. Yes, you have had lots of changes...but from reading your post I see that you are already moving on to the next challenge (with the help of a little chocolate, good ice cream, and conversation). You are right, we all need nourishment in our writing to keep us going and the SOL provides great food for this. What a great quote. One we really need to remember. Too many times it is should do this or that. Great reflective post. So fun to read your post. Lots of changes and challenges for you. One step at a time. Trying to figure out my writing life in retirement. I nourish the writer by reading. Still working on the writing end - challenging myself with one more post a week (for Poetry Friday). You have been going through a lot of changes in a short amount of time. I once told myself when I switched jobs to give myself 3 years to become an expert. It takes time to gain the experience and insight. I am in my 8th year teaching gifted and finally feel settled and calm. I'm glad to see you back on the blog. It's nice to connect with wonderful teachers.